Discover the tropical paradise that lies south of Puerto Vallarta on this bargain-priced tour. We'll skip by the downtown area, and head to nature. On the way we'll stop at the mirador along the coast to take pictures of Los Arcos, & see Mismaloya, where the movie Night of the Iguana starring Richard Burton was filmed. Then we continue along the bay towards Chico's Paradise Jungle Restaurant, where many movies have been filmed, including Ringo Starr's Caveman and Acapulco H.E.A.T. A short nature walk through the tropical jungle will take us to Las Orquideas Paradise, where we have plenty of time to swim in the placid pools below the waterfalls, explore another nature trail, or just relax at river's edge. 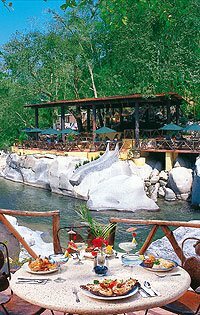 You can also order lunch or drinks from the restaurant's menu and enjoy the riverside ambience. Make friends with the resident python and coati mundis, and always keep a lookout for the local wildlife like iguanas and tropical parrots. Zip down the water slides and cool off from the jungle humidity with a refreshing swim. This is mostly a relaxing getaway far from the hotels and the bustle of the city for a rock-bottom price. Runs: Monday, Wednesday and Friday from 10:00AM to 4:00PM. Money for Lunch (if you wish). Swimsuit & Towel (if you want to swim).